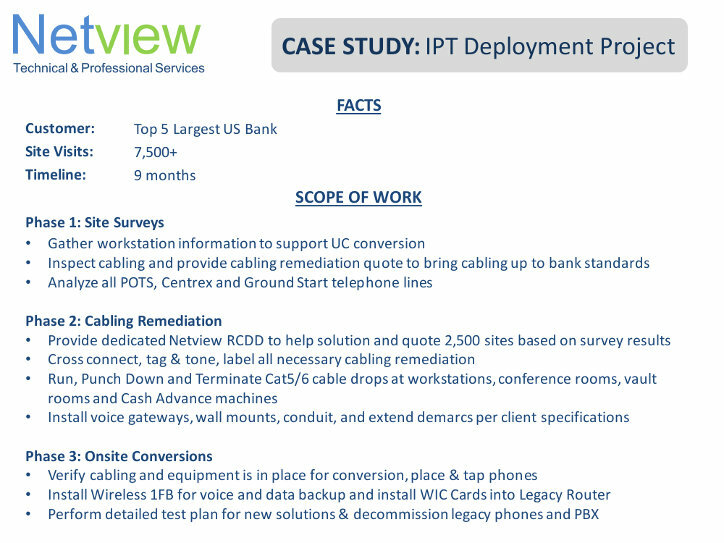 Netview specializes in Network Infrastructure, Telecom and Professional Staffing/Services support. 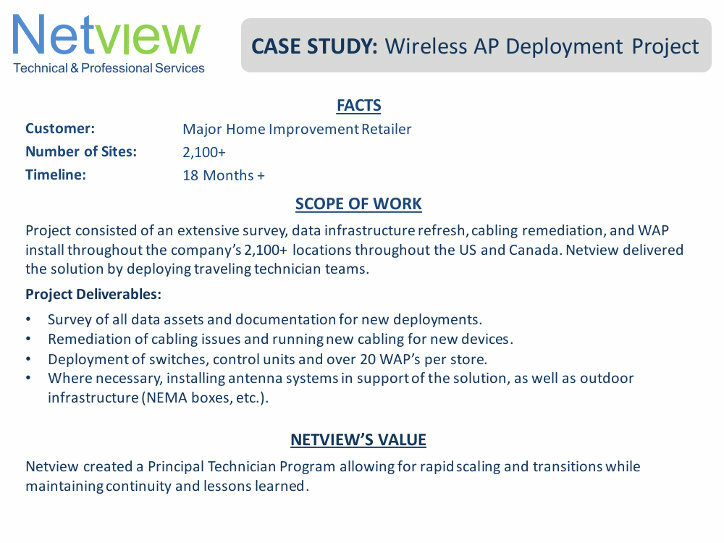 We successfully complete tens of thousands of multi-site, multi-service, and multi-technology deployments throughout North America annually. In addition, we provide Technical Staffing in support of Fortune 500 companies throughout North America. Our experience and results have earned us the trust of global organizations that need to minimize project costs and time, while maintaining the highest quality. 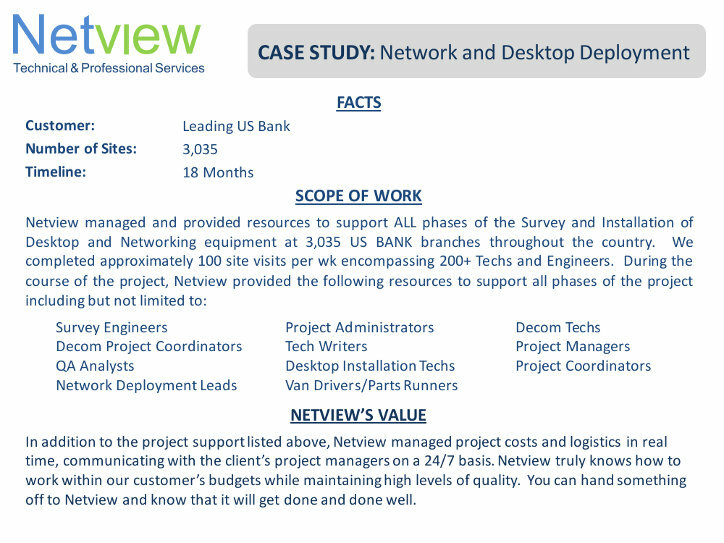 Netview boasts a lengthy portfolio of successful deployments, excellent project tracking and best practices. Netview is in the business of helping people succeed. We promote this value system throughout the ranks, whether it is stepping up to fill customer “mini-gaps” or capturing documentation that will help our customers manage a critical issue. 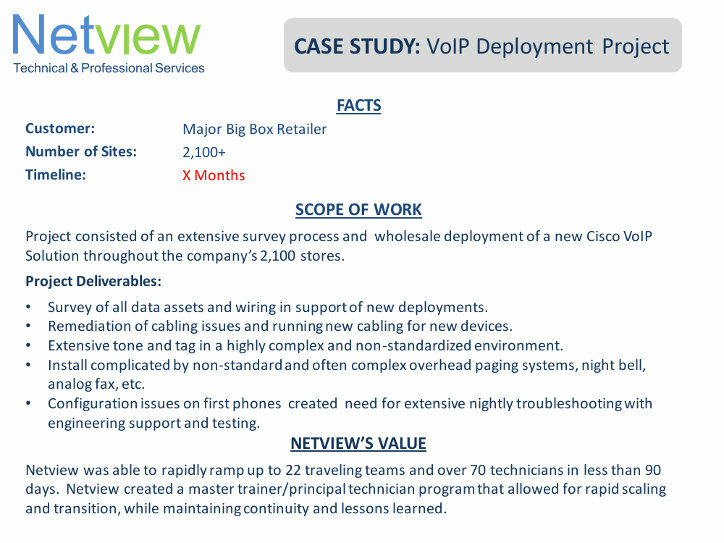 In a tough business that is often reduced to commodity, this enables Netview to offer a best-in-class service. We encourage you to speak with others that have chosen Netview, and hear about their positive experiences. 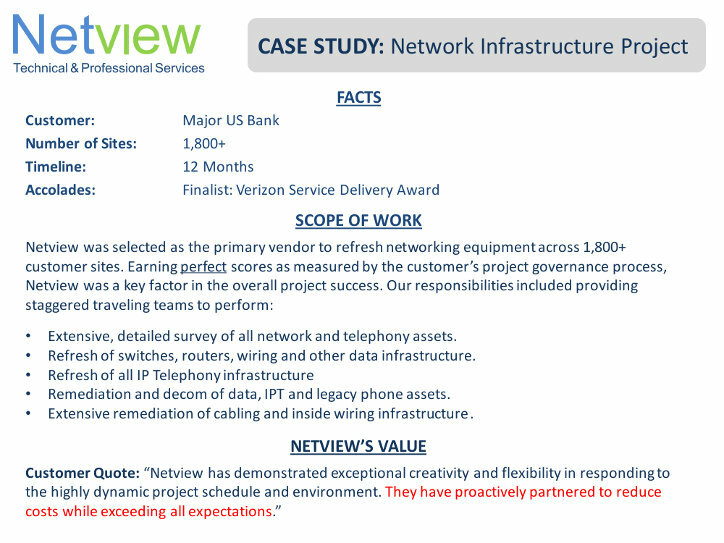 Netview remains Humble and Hungry and looks forward to working with you and adding value to your organization. 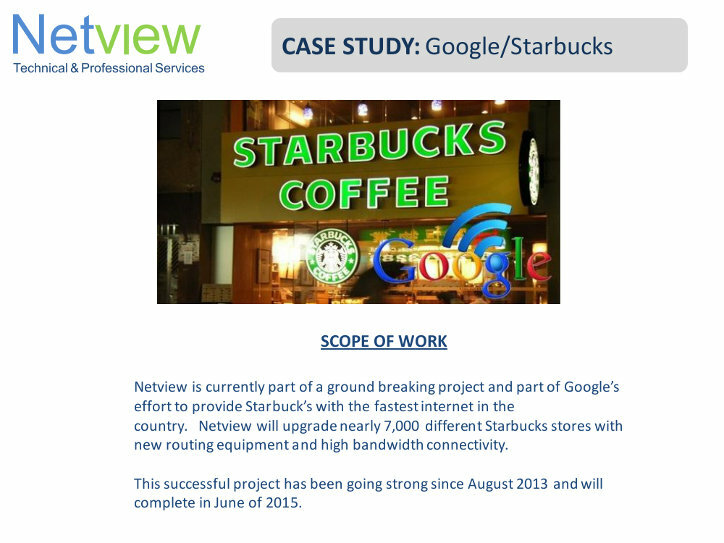 Netview works to build a structure for success. Pre-project planning of routes and schedules is an often overlooked element of success, and undervaluing the logistical flow of technicians undermines quality and continuity. Protecting customers from this trap is a critical value-add. 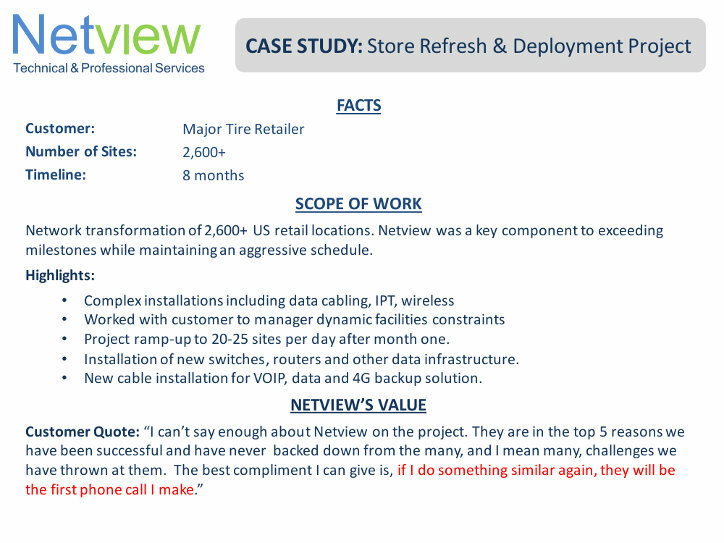 During the pilot, Netview PM’s perform installs, working with the customer in order to fully internalize all elements of the install, including constraints and challenges. This way, our PM on the bridge is “hands-on” and can steer and validate the technicians’ work, real-time. We generally “over document” and can make the data available on a FTP. 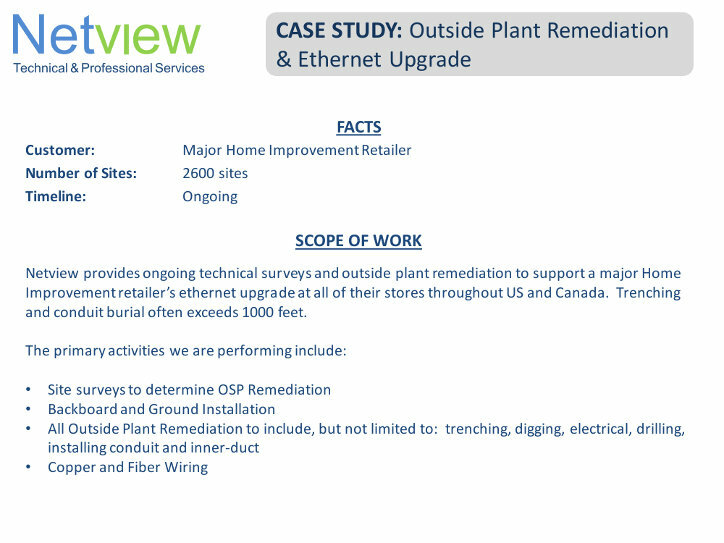 When there are questions about a site, Netview is fast to provide supporting details, pictures and documents. "Where Commitment, Flexibility, and Technology meet Common Sense"